Next month I will be giving two talks at St. Thomas University in Minneapolis. I’ll be focussing on how environmental communication needs to help build a culture of sustainability (or whatever you prefer to call an ecologically and socially just future) while it tries to address immediate issues. Here are the summaries. Achieving sustainability will require more than just clean energy sources, protecting the oceans, eliminating poverty and the rest of the 17 UN Sustainable Development Goals. To support all of these, we need a transition to a culture of sustainability. That means our beliefs, values, aesthetics, worldviews, and institutions – in sum, our culture, must change. For that to happen, communication about ourselves and our place in the world must necessarily evolve. We need a new story about who we are as a species. The Syracuse, NY gas station that got wrapped. Here is a video about environmental art and its role in questioning and shifting culture and values. 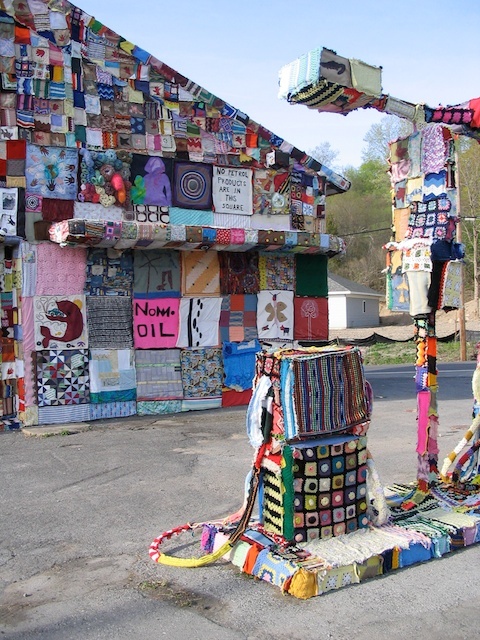 It features Jennifer Marsh’s 2007-2009 Gas Station Project in Syracuse to wrap an abandoned gas station in my neighborhood with panels of various fabrics. In addition to an interview with Jennifer, you can watch me and my student Caroline Massa talk about the project and environmental art in general.